Contact us for great prices on your boxing needs as well as expert advice on what your needs will be on preparing for the move. Packing doesn’t have to be a hassle. If you’re getting ready to move and plan to do most or all of the packing yourself, the following tips can you time, money and headaches. Start packing the things you are not going to need until after the move such as summer or winter clothes, keepsakes and holiday decorations as soon as you know you are moving. Give yourself plenty of time to pack by setting packing dates at least one to two days before your scheduled move date. Pack non-technical items such as books, clothes, blankets, linens, pillows and toys. Separate your house into sections. Work on and complete one section at a time. To provide the greatest protection for your assets, use smaller, sturdy boxes for heavy items and label all boxes accordingly. Make use of packing paper and bubble wrap to secure fragile items and those that are difficult to pack. Wrap items carefully and provide plenty of cushioning. Use ONLY sturdy boxes that can be securely shut. Use a black marker to label boxes clearly on several sides. The label should include a general list of the contents of each box and the room in which it will need to be placed in your new home or office. Load heavy boxes on the bottom and lightweight boxes or those with fragile items on top (Note: If enlisting professional moving assistance, label boxes with fragile items as "Fragile," those to be loaded on top as "Top Load,” and those that should not be tilted as "This Side Up"). Use moving pads to protect furniture and large appliances. Take extra care when wrapping and packing fragile and difficult-to-pack items such as dishes, glasses, knick knacks, crystal, china, electronics, mirrors and pictures. Plates, saucers and bowls should be wrapped separately, bundled and stacked in sets of three or four. Each stack should be wrapped again before being placed in a cushioned box. Stacks of fragile items should never lay flat. Bowls should be placed face down. Cups and glasses should be wrapped individually and then placed rim down in the middle or top layers of the box. Extra delicate crystal, figurines, knick knacks and fine china should be packed with extra paper and/or bubble wrap. 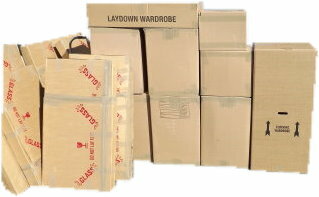 You may also pack these items in small boxes and then place them into larger boxes with a lot of cushion. Record the serial numbers and model numbers of computers, stereo equipment and other electronics. If possible, repack electronics in their original boxes. If the original is not available, carefully wrap each item individually with layers of cushion on each side. Large screen televisions should be padded and a large piece of cardboard should be taped over the screen but not directly to the screen. When constructing mirror and picture boxes, fold along the creases and slide the boxes together. Typically, two pieces will be used for small pictures and four pieces for larger pictures or mirrors. Place two inches of cushion (crinkled up paper) around the edges of mirror and picture boxes. Pack mirror and picture boxes tightly to avoid shifting during moving. By law, moving companies may not transport hazardous materials. Be sure to find an alternative solution for packing and moving the following items.